If one part of the kinetic chain is not functioning properly dysfunction occurs throughout the body. Although parts of the kinetic chain may seem separate each system and its various components must collaborate and work together (Clark and Lucett, 2011). For example, when a dysfunction, such as flat feet occurs in the foot/ankle complex it affects all parts of the kinetic chain. As this individual attempts to perform a functional activity, such as an overhead squat their dysfunctions will have a direct impact on the knees, LPHC, and low back. As this individual repeatedly performs their overhead squat with poor technique they are susceptible to various injuries that include: plantar fasciitis, achilles tendinopathy, medial tibial stress syndrome, ankle sprains, and patellar tendinopathy (Clark and Lucett, 2011). Over time this individual may complain of knee and/or low back pain, but often times their pain is a direct result of moving inefficiently. To reduce the likelihood of this individual experiencing any pain or moving improperly one will need to be on a structured corrective exercise program to optimize performance and decrease the risk of injuries. Clark and Lucett 2011. NASM Essentials of Corrective Exercise Training. Lippincott Williams & Wilkins 2011. There are many health benefits to regular exercise and physical activity in our society today. Physically fit individuals experience fewer symptoms of depression, anger, and stress than those exercising infrequently or not at all (Stroth, Hille, Spitzer, & Reinhardt, 2009). Exercise all also boosts blood flow to the brain and helps it receive nutrients and oxygen. The better physical condition an individual is in, the faster one’s brain waves fire to think and react quickly. Additionally, increased physical activity is associated with lower risks of blood pressure (Burns, Hnin, & Thuy, 2012). Therefore, to avoid these adverse health issues regular exercise is essential to keep the body and mind healthy. With the vast variety in exercise selection there are many options for individuals to choose from when deciding what form of exercise to do. For an individual in their late 20’s and early 30’s I would select cardiovascular training. People in this age range are typically in high stress jobs and need an outlet to eliminate their stress. Evidence suggests that aerobic training does reduce cardiovascular reactivity to psychological stress (Spalding, Lyon, Steel, & Hatfield, 2004). As a result of their cardio training, these individuals would have lowered stress levels enabling to be more productive at work. Additionally, it is recommended for these adults to participate in at least 150 minutes of moderate-intensity cardiovascular activity each week (O’Donovan, Blazevich, Boreham, Cooper, Crank, Ekelund, & Stamatakis, 2010). By performing cardiovascular training regularly these individuals will have optimal heart health and reduced stress. For an elder individual cleared for regular exercise I would suggest resistance training. Resistance training has been found to increase muscle strength and endurance in elders (Fahlman, McNevin, Boardley, Morgan, & Topp, 2011). Many of these individuals have frail bones and being on a structured resistance training program will prevent them from future problems such as osteoporosis. Research has shown that older adults can increase their strength and functional abilities through progressive resistance training (Cyarto, Brown, Marshall, & Trost, 2008). Thus, resistance training is essential for the elder population. Additionally, resistance training is vital for the elder population to prevent falls and accidents. Reduced muscle strength and deficits in static and dynamic posture are significant risk factors for falls in old age (Granacher, Zahner, & Gollhofer, 2008). Thus to reduce the risk of falling, elderly individuals need to be participate in some form of resistance training to prevent accidents and to keep their bones strong. Regular exercise is essential to living a healthy and stress free lifestyle. With the assortment of exercise choices available today there are many options for people to choose their preferred exercise type. For people in their late 20’s and early 30’s cardiovascular training is an excellent choice as it relieves stress. Elders receive numerous benefits from resistance training, which will prevent them from harmful accidents and or injuries. 1. Burns, S. F., Hnin Hnin, O., & Anh Thanh Thuy, T. (2012). Effect of Sprint Interval Exercise on Postexercise Metabolism and Blood Pressure in Adolescents. International Journal Of Sport Nutrition & Exercise Metabolism, 22(1), 47-54. 2. Cyarto, E. V., Brown, W. J., Marshall, A. L., & Trost, S. G. (2008). Comparison of the Effects of a Home-Based and Group-Based Resistance Training Program on Functional Ability in Older Adults. American Journal Of Health Promotion, 23(1), 13-17. 3. Fahlman, M. M., McNevin, N., Boardley, D., Morgan, A., & Topp, R. (2011). Effects of Resistance Training on Functional Ability in Elderly Individuals. American Journal Of Health Promotion, 25(4), 237-243. 4. Granacher, U., Zahner, L., & Gollhofer, A. (2008). Strength, power, and postural control in seniors: Considerations for functional adaptations and for fall prevention. European Journal Of Sport Science, 8(6), 325-340. 5. O'Donovan, G., Blazevich, A. J., Boreham, C., Cooper, A. R., Crank, H., Ekelund, U., & ... Stamatakis, E. (2010). The ABC of Physical Activity for Health: A consensus statement from the British Association of Sport and Exercise Sciences. Journal Of Sports Sciences, 28(6), 573-591. 6. Spalding, T. W., Lyon, L. A., Steel, D. H., & Hatfield, B. D. (2004). Aerobic exercise training and cardiovascular reactivity to psychological stress in sedentary young normotensive men and women. Psychophysiology, 41(4), 552-562. 7. Stroth, S., Hille, K., Spitzer, M., & Reinhardt, R. (2009). Aerobic endurance exercise benefits memory and affect in young adults. Neuropsychological Rehabilitation, 19(2), 223-243. The largest myth in the fitness world is that sit-ups are the best exercise to strengthen your core. Many individuals believe that sit-ups are an affective exercise because they isolate the rectus abdominus or six-pack muscles. For individuals with insufficient core strength a sit-up would not be a desirable exercise because of all the movement at the spine. These people need to begin with core stabilization to strengthen the transverse abdominus, obliques, lumbar multifidus, pelvic floor muscles, diaphragm, and transversospinalis (Clark and Lucett, 2008). When people have weak stabilizing muscles it increases the forces throughout the lumbo-pelvic hip complex that can potentially lead to low back pain and injuries. Therefore, to reduce the amount of injuries associated with performing sit-ups individuals need to start their core training with core stabilization exercises to provide adequate stability throughout the lumbo-pelvic hip complex. A weak core can cause multiple problems throughout the entire kinetic chain. The core is the body’s center of gravity and where all movement begins. A strong core is essential for maintaining optimal muscle balance throughout the entire kinetic chain. The core musculature is divided into two separate categories: the stabilization and movement systems. The stabilization system is responsible for stability of the lumbo-pelvic hip complex and the movement system is responsible for movement of the core (Clark and Lucett, 2008). Both systems work together as an integrated functional unit and when one system is not functioning properly the kinetic chain is altered creating various dysfunctions throughout the upper and lower body. Additionally, when people train the movement system before the stabilization system individuals would be susceptible movement compensations, synergistic dominance, and inefficient movements creating dysfunctions throughout the entire kinetic chain. Therefore, individuals need to strengthen their core properly by beginning with core stabilization to avoid dysfunctions throughout the upper and lower body. Clark and Lucett 2008. NASM Essentials of Personal Fitness Training. Lippincott Williams & Wilkins, 2008. Currently, there are many professional athletes who are suffering from hamstring and groin strains. Many of these athletes are exhibiting compensations in the LPHC due to an underactive gluteus maximus. When an athlete exhibits increased hip or spinal flexion it can lead to excessive stress being placed on the low back resulting in pain. Additionally, it can also increase stress on the hamstrings and adductor magnus, which maybe compensating for an underactive gluteus maximus and erector spinae to provide stability to the LPHC, which results in a large amount of hamstrings and groin strains (Clark and Lucett, 2011). Hamstring injuries are extremely common in sports today. Sprinters who participate in track and field events have reported that hamstring injuries account for 26% of all the injuries sustained while competing (Opar, Williams, & Shield, 2012). Sprinters are susceptible to hamstring and groin strains due the overactivity in their hamstring complex. To prevent these injuries athletes need to be on a structured flexibility training program to increase the range of motion and extensibility of these neuromyofascial tissues. Additionally, improved hamstring flexibility may reduce the risk of hamstring injuries due to a great ability of the passive components of the muscle-tendon unit to absorb energy as a result of improved compliance (Opar et al., 2012). Opar, D. A., Williams, M. D., & Shield, A. I. (2012). Hamstring Strain Injuries: Factors that Lead to Injury and Re-Injury. Sports Medicine, 42(3), 209-226. The knees’ moving inward is a prevalent movement compensation that consistently arises in most of my overhead squat assessments. Knee valgus during the overhead squat assessment is influenced by decreased hip abductor and hip external rotation strength, increased hip adductor activity, and limited ankle dorsiflexion (Clark and Lucett, 2011). As individuals consistently squat with poor technique length tension relationships, force couple relationships, and neuromuscular efficiency are all negatively affected thus placing added stress on the entire kinetic chain. As a result of this significant movement compensation, individuals are susceptible to various injuries including: patellar tendinopathy, patellofemoral syndrome, ACL injury, and IT band tendinitis (Clark and Lucett, 2011). To prevent knee valgus, individuals need to follow the Corrective Exercise Continuum to prevent injuries and move optimally. First, these individuals need to inhibit and lengthen their adductors, short head of the bicep femoris, TFL, lateral gastrocnemius, and vastus lateralis to decrease the overactivity in these neuromyofascial tissues. After completing the first two phases they need to activate their medial hamstrings/gastrocnemius, glute medius/maximus, VMO, and anterior/posterior tibialis to reeducate or increase activation of their underactive tissues. These individuals will conclude with integration exercises that include lateral tube walking to retrain the collective synergistic function of all muscles through functionally progressive movements (Clark and Lucett, 2011). By following the four phases of the Corrective Exercise Continuum individuals will prevent their knees from moving inward when performing an overhead squat. It is vital for health professionals need to screen their patients and clients thoroughly to investigate for movement compensations. 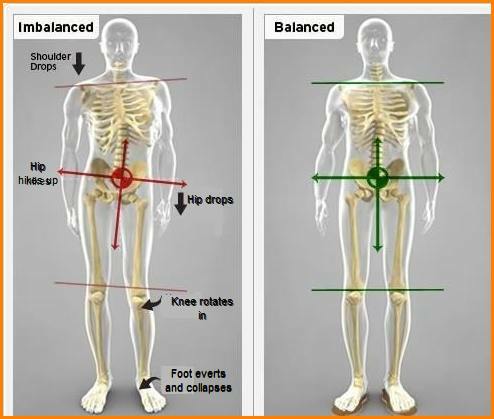 If a movement compensation such as the knees moving inward is found in the overhead squat assessment health and fitness professionals need to create thorough training programs to eliminate this compensation. By following the steps of the Corrective Exercise Continuum these individuals will move more optimally and ultimately reduce their chances of experiencing an injury. Many elder individuals over the age of 50 are getting total knee replacements due to osteoarthritis. This occurs when the cartilage that cushions the bones of the knee softens and wears away. Knee osteoarthritis increases with age and is characterized by muscle weakness, joint instability, joint deformity, pain, and stiffness (Levinger, Menz, Wee, Feller, Bartlett, and Bergman, 2011). Total knee replacement is a common surgical procedure used for the management of knee osteoarthritis. The primary objective of getting a total knee replacement is to relieve pain for individuals who have severe osteoarthritis and to improve their quality of life. Many individuals who get a total knee replacement complain of stiffness and limited range of motion around the knee (Arbuthnot and Brink, 2010). After successful total knee replacements many individuals have improved range of motion around the knee. Individuals who get a total knee replacement need to be on aggressive rehabilitation programs to improve the strength, range of motion, and neuromuscular control in the lower extremities. People who have undergone total knee arthroplasty are susceptible to reduced functional performance and knee extension strength. The initial reduction in knee extension strength is caused by the quadriceps being inhibited due to knee swelling, pain, and inflammation (Holm, Husted, Kehlet and Bandholm, 2012). To offset this reduction in knee extension strength individuals need to be on thorough training programs to improve their strength and neuromuscular control in their lower extremities. It is very important for health professionals need to provide their patients and clients with thorough training programs to help them reduce the likelihood of getting a total knee replacement. By educating their patients and clients on the importance of keeping their bodies strong and healthy they will help them reduce their chances of experiencing this painful injury. Arbuthnot, J. E., & Brink, R. B. (2010). Arthroscopic arthrolysis for the treatment of stiffness after total knee replacement gives moderate improvements in range of motion and functional knee scores. Knee Surgery, Sports Traumatology, Arthroscopy, 18(3), 346-351. Holm, B., Husted, H., Kehlet, H., & Bandholm, T. (2012). Effect of knee joint icing on knee extension strength and knee pain early after total knee arthroplasty: a randomized cross-over study. Clinical Rehabilitation, 26(8), 716-723. Levinger, P., Menz, H. B., Wee, E., Feller, J. A., Bartlett, J. R., & Bergman, N. R. (2011). Physiological risk factors for falls in people with knee osteoarthritis before and early after knee replacement surgery. Knee Surgery, Sports Traumatology, Arthroscopy, 19(7), 1082-1089. Ryan specializes in helping chronic pain sufferers address and eliminate recurring body aches through expert-designed flexibility, posture and strength training. 1) they use their back to assist them in lifting the heavy weight. As a result they are compensating and take the focus away from the bicep curl. 2) They use their shoulders to assist them during the curl. To correct this, use a weight light enough so that you can properly perform the exercise with your shoulders retracted at a slow tempo. Rowing machine – many people do this exercise incorrectly by using their whole body to pull the weight back instead of keeping their upper/lower body still. 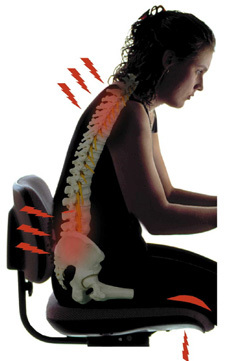 As a result of using their entire body, they don’t isolate the muscles in their mid back. When done correctly the legs are fully extended, the shoulders are back, the head is in neutral and the arms pull the cable back with no help from the lower body. Calf raises – this is one of the most common exercises that people perform incorrectly. The main mistake that people make is letting their calf go below the height of the ground, which turns the exercise from a strength exercise to a stretch. To perform this correctly, rotate the leg/foot inward and raise your foot up and hold the contraction for 2 seconds and then return downward in 4 seconds. Never let the foot go below the height of the ground (if done on an elevated) surface. Squats – A common mistake people make when squatting is turning their feet out and their knees inward. This is a result of tightness and weakness in different parts of their lower body. To compensate for the feet turning out, make sure you stretch the lower calf muscle along with the hamstring – this will help alleviate pressure on this part of the leg and allow it to function properly. To correct for the knees moving inward, stretch the inner thigh before doing the squat. Have you ever heard of pronation? You see, pronation is when your feet naturally fall inward, toward your body's midline. But too much is not a good thing. That's when the term "overpronation" comes in. Since we already know what regular pronation means, overpronation is when your feet fall too much inward, more than it should. As a result of overpronation, your knee and hip alignment are thus affected. It can actually lead to a number of injuries! In fact, for starters, it can cause inflammation in your feet, which is extremely uncomfortable. If left unattended, it can lead to other problems. You would think that discomfort alone is more than enough, but unfortunately, it can actually go farther than that. When symptoms begin to show, even walking can start to feel awkward. And on top of that, your calves and feet will feel strained as well. But have no fear! For Corrective Exercise Specialists, their job is to make sure that not only do you avoid discomfort, but also guide you in eliminating it. With that said, how about some exercises? Try these simple ones: a.) 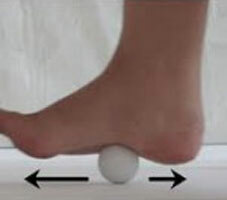 massage your arches with a golf ball, and/or b.) stretch your calf muscles. Before beginning any exercise program, every individual should be assessed properly and thoroughly. I mean, how else would you know how to go about the program without completely knowing yourself and your proper needs? To start, you and your trainer must be familiar with your requirements; otherwise, the program will not benefit you in ways you quite expect. Without a thorough assessment, the client is left with only half of what they need and deserve. Which brings me to the question: why don't most trainers do a thorough assessment before beginning their clients' programs? This would be quite a shock to most people. You see, most trainers tend to train on what they already know from their own training or personal experiences. They also seldom inquire about the needs of the client(s). However, with a good trainer, it should be all about the client. Through working with a caring and attentive trainer, the clients are safe with a program custom-designed to their goals and what is drawn from the assessment. All programs should begin as such to best benefit the clients. With a focused trainer, the clients are - as they should be - properly assessed. And with a trainer who is attentive and responsible, each program is custom to each client according in their needs. article 10: Why do I have chronic pain? Often times, people tend to be couch potatoes. When you think about it, we've all been that person at one time or another in our lives. However, lazing around too much can have its apparent physical downfalls. Aside from the fact that it takes away time to better your health and fitness, it can actually hurt you over time. And this is where the anterior pelvic tilt comes in. Have you ever heard of it before? Well, let's get into it, shall we? 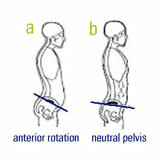 The anterior pelvic tilt occurs when the hip flexor muscles (iliacus and Psoas) suddenly tighten up and become overactive. Furthermore, another cause of this is an underactive glutes. These parts are not very strong, which will then permit the tight and overactive deep hip flexor muscles to be able to tug on the pelvis and lumber spine forward. Commonly, this is a pain people find in their lower back. Have you personally ever experienced this? So, how exactly do you fix these issues? Well, corrective exercises are the solution to that. To give the pelvis a chance to return to its upright position, try some stretches to loosen the tight deep hip flexors. 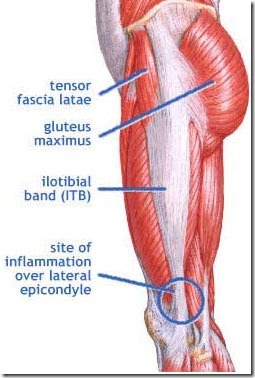 As for the glutes, also try isolated strengthening to correct the anterior pelvic tilt.